Louvre Museum - Musée du Louvre, one the world's largest museums. The Louvre first opened on August 10, 1793. With nearly 10 million visitors each year, the Louvre is the most visited museum in the world. The Mona Lisa was stolen by a Louvre employee in 1911. After being exhibited across Italy, it was finally returned to its Paris home in 1913. The famous painting was also intentionally damaged on two occasions in 1956. The first incident occurred when a vandal threw acid at it. The second when a rock was thrown at it. These days, the Mona Lisa is kept in a bulletproof glass case in climate-controlled conditions. The Louvre was originally built as a fortress in the 12th century. It also served as a royal palace for some time until Louis XIV moved to the Palace of Versailles in 1682. There are two satellite museums to the Louvre. The first opened in 2012 in the Northern France city of Lens. The other will be located in Abu Dhabi and is set to open in 2015. The Louvre Museum, or the Musée du Louvre, as it is known in French, is the largest palace and museum in the world. Situated in the center of Paris France, it occupies the beautiful Louvre Palace. This building was originally built as a fortress in the 12th century and served as a royal palace until 1682, which was when Louis XIV moved to Versailles and took the government along with him. An almost rectangular structure, the Louvre wraps around a central square known as the Cour Napoléon. It is in this square that you will find the renowned glass pyramid that was designed by I.M. Pei and inaugurated in 1988. Rather controversial at first, the Louvre Pyramid has become widely accepted over time and is now considered to be a major Paris landmark in and of itself. Complementing the main Louvre Pyramid are some similar pyramids that are much smaller and the Inverted Pyramid, which serves as a skylight for the underground shopping complex that is in front of the Louvre Museum. Of course, no discussion about the Louvre would be complete without going into detail about what you'll find inside. After examining the Cour Napoléon square and its resident Louvre Pyramid, visitors to the Louvre Museum are ready to go inside for a look around. The two most famous works that are housed inside this grand institution are the Mona Lisa and the Venus de Milo. Probably the most well known painting in the world, the Mona Lisa is a half-length portrait of a woman that was painted by none other than the famous Italian Renaissance polymath - Leonardo da Vinci. According to the Louvre Museum, da Vinci worked on the Mona Lisa between the years of 1503 and 1506, though it is widely considered to be difficult to confirm the exact dates. Popular consensus also has it that the woman who served as the sitter for the Mona Lisa was Lisa del Giocondo, who hailed from the Gherardini family of Florence and Tuscany and married a wealthy Florentine silk merchant who went by the name of Francesco del Giocondo. As for the Venus de Milo, or Aphrodite of Milos, as it is also known, it is a statue that ranks among the most famous sculptures to have come out of ancient Greece. The armless statue was created sometime around 100 BC and is believed to depict the Greek goddess of love and beauty - Aphrodite. Aphrodite was known as Venus to the Romans. The artist who created Venus de Milo is believed to have been Alexandros of Antioch. 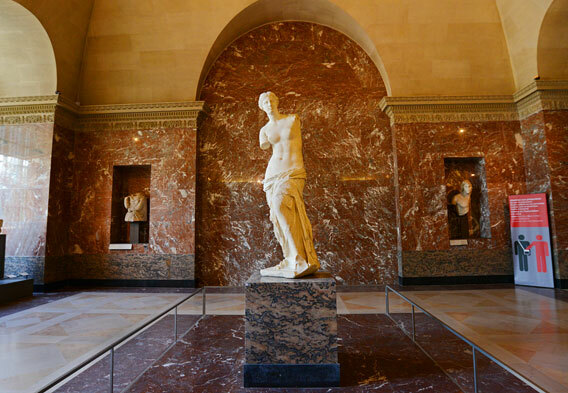 While the Mona Lisa and the Venus de Milo rank as the most famous attractions inside the Louvre Museum, they certainly aren't the only works of note. The Virgin and Child with St. Anne and the Virgin of the Rocks are two other enchanting paintings by Leonardo da Vinci that deserve a look, and visitors shouldn't miss Gilles by Jean-Antoine Watteau or the great masterpieces of David, which include The Oath of the Horatii and the Coronation of Napolean. Other notable displays contain such things as fragments of the Parthenon frieze, Michelangelo's Esclaves (Slaves), Ingres's The Turkish Bath, and Boucher's Diana Resting After Her Bath. The list goes on and on, in which case it is best to budget an ample amount of time for Louvre visits. There is so much to take in at the Louvre Museum in Paris that it can be difficult to know where to start and where to end. The museum displays are divided into no less than eight different departments. Combined, these departments contain somewhere in the neighborhood of 30,000 works, including Greek and Roman antiquities, northern European and French paintings, decorative arts, sculpture, and Oriental antiquities. While the main focus of the Louvre Museum is centuries-old masterworks, it also has displays that are dedicated to contemporary art. It isn't just the paintings, sculptures and other works of art that are of interest, however. The architecture of the Louvre Museum is art in and of itself. Because of its beauty, it isn't difficult to believe that this was once a royal palace. It is important to note that since the structure was altered numerous times over the centuries, it features a blend of architectural styles. Also worth noting is that the uniform facades that were constructed in the 1500s are generally credited with establishing the Parisian Renaissance style. The address for the Louvre is listed on the museum's website as Musée du Louvre, 75058 Paris - France. This puts the famous institution on the Right Bank of the Seine River in the city's 1st arrondissement. For those who are planning on taking the Metro, lines 1 and 7 will get you there. The Metro stop is Palais-Royal Musée du Louvre. The museum is open every day except Tuesday from 9 AM to 6 PM, with extended hours on Wednesdays and Fridays until 9:45 PM. Special days when the museum is closed include January 1, May 1 and December 25. The main entrance for the Louvre in Paris is in the glass pyramid in the Cour Napoléon. Admission prices apply, and tickets can be purchased online in advance through the website if you want to avoid waiting in line. There is also the Paris Museum Pass, which allows for admission to more than 60 museums and attractions in Paris, including the Louvre. 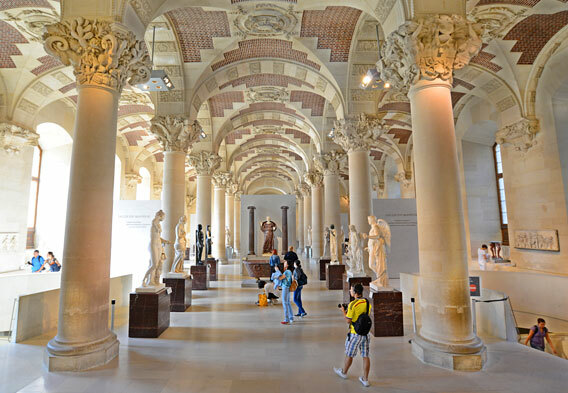 Audio guides can help Louvre visitors enhance their visits, as can guided tours and the special "Visitor Trails" that offer thematic approaches to visiting the museum. The Visitor Trails are available online and can be printed out prior to a visit. Because of the Louvre Museum's central location in Paris, there are plenty of hotels to choose from that are close by. Of course, some hotels are closer than others. Among those that offer the most in the way of proximity is the Hotel Louvre Paris - A Hyatt Hotel (pictured). Another good lodging bet in the area is the Grand Hotel du Palais Royal. 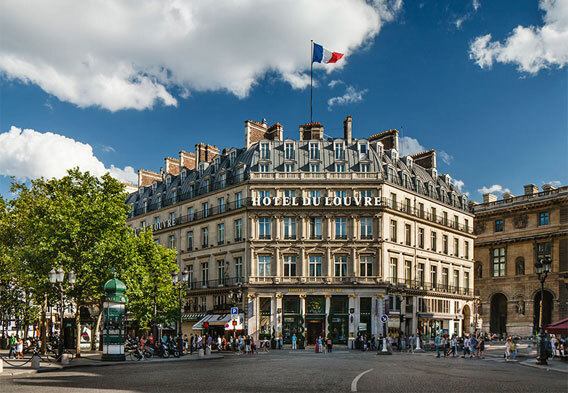 Both of these hotels are quite luxurious and can be an excellent fit for anyone who is looking to enjoy style and comfort during their Paris visits.